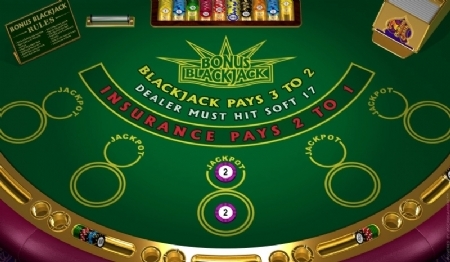 Bonus Blackjack is an exciting variant of the normal blackjack game. This game provides players with an optional side wager where players can win more on the first two cards that are dealt. The rules of the regular game apply in this game and the bonus will be added to the players winning amount. The main objective of this game is to win the hand of the dealer by getting as close as possible to, or hitting 21without going bust. The two decks of regular cards used for game play are shuffled before every game. Play this game for an innovative and exciting blackjack experience.